Most quilters probably have a "coveted item" here and there that has not been used. I have four Moda Layer Cake packets in the citrus "flavor." That is 160 10" blocks (40 times 4). Would cutting them into 5" blocks and making a D9P be the answer? I need something quick and encouraging. Any other suggestions or picture samples would be appreciated. GramMER to eighteen, plus two great-granddaughters and four adopted greats soon we hope! The pattern and the quilt in the link you sent are cute! However, the layer cake in this pattern has printed fabric. Mine is strictly Moda Marbles in Citrus colors. I wondered whether I should consider putting prints with this series or maybe make it all plain to focus on the bright color changes. I have wondered about "Trip Around the World," but I may not be qualified to do that yet. My go-to pattern for layer cakes is Double Slice Layer Cake by MSQC. I would think this would look fine in solid colors. I think Around the World is super quick and easy! It can be strip pieced/tube pieced and then recut and assembled. Can use the same method for quite a few variations as well. OK, I am beginning to see how this might be in all solids. I found another link here that might look good too. What do you think? Do you have a tutorial for this? I need something quick and simple. I found this on YouTube..
Now I just have to copy what she wrote and see if I can do it! I am still open for suggestions, so keep them coming. If I had your fabric, I'd probably cut two 5" charms from each layer cake and then cut two strips from each, and then make a French Braid. Those colors would be gorgeous in a FB, and they really aren't too hard to make. Plus you'd still have some charms for four-patches or what have you. Our library has this book; yours might too. Check out Moda Bakeshop - it is loaded with pre-cut easy projects - you would be surprised how much is there - also check Bonnie Hunters blog - she uses scraps but her patterns are step by step with pics so very easy to follow along - Bonnie has a pattern called scrappy bargello - your layer cakes would work for that. Another good site with pre-cut patterns is Missouri Star Quilt Co - they have tons of charm pack and layer cake patterns - you could make a lot with your layer cakes - good luck and don't forget to show us your quilt. Oh, these look lovely and easy too. I remember seeing several color graduated French braid table runners and maybe even some quilts. I need to revisit the pictures files! Oh, these sound so good and maybe even easy! This would look great in solids! I should think you could start with squares of any size and just go for it. Absolutely! I thought of this when I mentioned the D9P, but lost the thought again. Hmmmm! Why is it that I finally find the right thing and then have to buy more cloth? This time it would be the Moda Honey Bun (1.5 strips) in black. I never can have things sent here to India because postage costs so much. Once again this would require waiting until we come home next year. Groan! I like the Double Slice Layer Cake. I don't have a link or a picture, but you can google it and find it. So I am really curious how you got the Missouri Quilt Company tutorial loaded into Vimeo. That was a top quality presentation. Wow! You really did a pretty one! Can you tell me about it? How big is the patch in the center? Is it the same size as the width of the strips? That is what it looks like from the photo. There was an ad for a PDF version of this, but I could not locate it. Any suggestions? A friend sent a message about a "quilt shop closing due to owner's retirement." Everything is on sale. I think this was not a recent ad, so it might all be gone by now. Would this be another UFO in the making or possibly a way to finish one after all? And then I keep remembering what my mother used to quote to me: "He that hath no rule over his own spirit is like a city that is broken down, and without walls" (Prov. 25:28). Oh, that would be really pretty! I have started a pinwheel quilt. It is a 3D version. Not a colorful one, but I am thinking the pattern I am using would make a pretty colorful one. 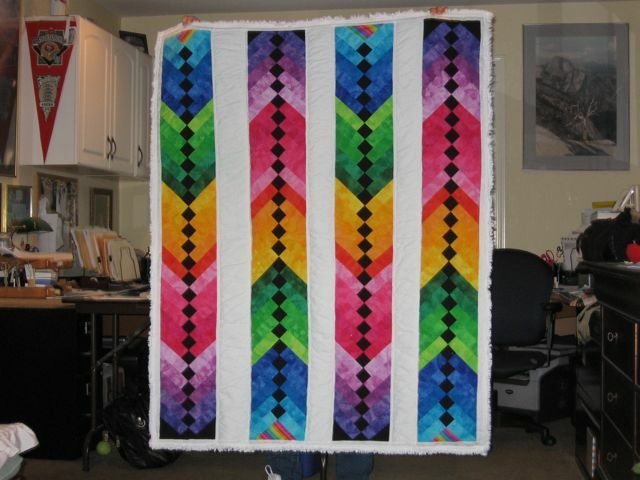 Willferg, that is a beautiful and colorful quilt! Can't wait to see what you decide on doing Grammer!